Nevada City is home base for one of the most spectacularly beautiful stretches of river in America, the Wild & Scenic South Yuba River. With its gushing waters, deep emerald swimming holes and forested natural beauty, the river is central to the lives of many Nevada County residents, who seek pleasure in its natural beauty. A state Wild & Scenic River, the South Yuba is the centerpiece of a 20-mile-long river corridor park, the state’s first, that stretches from Malakoff Diggins State Historic Park to Englebright Reservoir. The South Yuba River State Park is accessible from various locations, including several trailheads near Nevada City. These include Edwards Crossing, Purdon Crossing and the Highway 49 bridge. Trails wind along riverside canyons and visitors should be equipped with sturdy hiking shoes, food and water. Swimwear is optional in remote areas along the river. Independence Trail, located off Highway 49 four miles north of Nevada City is the nation’s first wheelchair accessible hiking trail. It is also popular for moms with strollers, older folks and others looking for a beautiful and easy nature hike. Bridgeport, located downstream, a half-hour’s drive from Nevada City is the headquarters of the South Yuba River State Park and the site of the longest single-span covered bridge in the U.S. Bridgeport offers interpretive history programs, docent tours, gold panning demonstrations and much more. The upstream Buttermilk Bend Trail offers some of the most beautiful spring wildflowers in the north state. South Yuba River State Park is open every day of year, except Christmas and New Years. The Visitor Center is located at 17660 Pleasant Valley Rd., Penn Valley; (530) 432-2546. Hours: noon to 4:00 p.m. daily in summer; noon to 4:00 p.m. Thursday through Sunday rest of year. 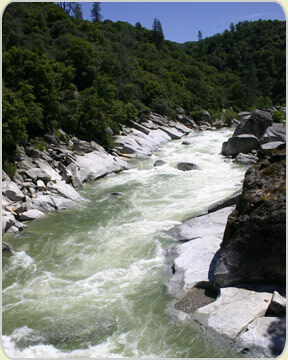 The Middle and North Yuba rivers, off Highway 49 about 30-60 minutes north of Nevada City, offer recreational day use and camping opportunities. Laing’s Crossing at the head of Bear Valley 20 miles east of Nevada City offers a higher mountain river experience. The Bear River below Rollins Lake, between Grass Valley and Colfax, is another popular getaway, popular with floaters and tubers. Guided white water rafting in the Gold Country & Lake Tahoe on the American River, Truckee River, Yuba River and many more. From mild to wild (kids form 4 yrs to Class 5 expert only). Half-day to 4 days. April-October.